1) Play Within Your Limits. It is easy to let the competitive juices start flowing and lunge for shots you have no business lunging for. Recognize your capabilities and allow for experience, strength, and flexibility to develop. 2) Do balance and core exercises. Pickleball involves extensive side to side and backward motions requiring neuromuscular training. This can be honed with balance and core exercises decreasing the risk of trips and falls, especially as we get older. 3) Wear court shoes. Running shoes are engineered for front to back, rolling heel to toe motion, heel cushioning, and good traction which is not conducive to the sport. Court shoes are engineered for side to side, lateral motion, with smoother soles less likely to “catch an edge” when side shuffling and sliding for a shot. 4) Warm up prior to playing. Warming up involves dynamic exercises to get the blood flowing to the muscles and tendons, and gets the joints moving smoothly. 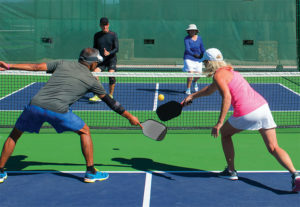 Dynamic warm ups can consist of brisk walking or biking to the pickleball court, and/or five to ten minutes of knee lifts, arm circles, lunges, touching the toes and walking the hands out into plank position and then back. 5) Do static stretching exercises. These can be performed AFTER a dynamic warm up to avoid overstretching injury to “cold” muscles and tendons. 6) Allow for proper resting. Muscles and tendons in the body need to rebuild and strengthen after exercise. Stress and overuse injuries occur when you play daily and do not allow for adequate time to rebuild. sprains or fractures of every foot and ankle joint, tendon ruptures and injuries including Achilles tendon, and foot and ankle post-traumatic arthritis, including total ankle replacements. Previous Carpal Tunnel Syndrome (CTS): What you need to know! Next VICTIM OF PERIPHERAL NEUROPATHY?